25th November - 2nd December 2005 - Eight days of storms from Central, NSW to tropical Queensland. 21st October 2005 - Very weak storm with nice rainbow. 8th December 2004 - Day 3 of Central, NSW storm tour - supercell at Nyngan. 7th December 2004 - Day 2 of Central NSW storm tour. 6th December 2004- Day 1 of Central, NSW storm tour. 5th September 2004 - Waterspouts off the Illawarra coastline. 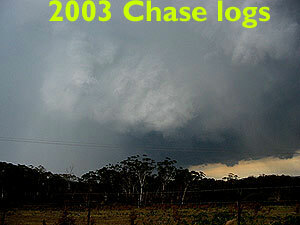 22nd November 2003 - Suspected supercell, Sw slopes, NSW. 21st November 2003 - A weak Bow echo on the SW slopes. 25th October 2003 - Gorillas in the mist chase - Southern Highlands. 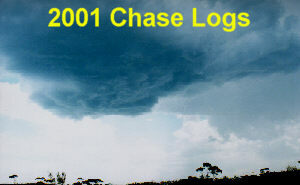 10th December 2002 - Severe squall line, NE NSW. 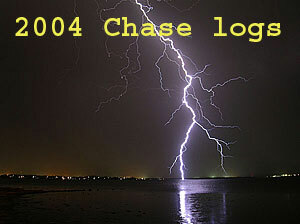 3rd August 2002 -First chase of the new season. 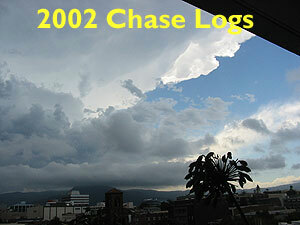 8th February 2002 - Severe Storms in Illawarra. 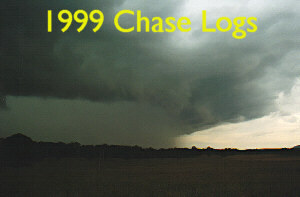 24th November 2001 - How I missed a Supercell. 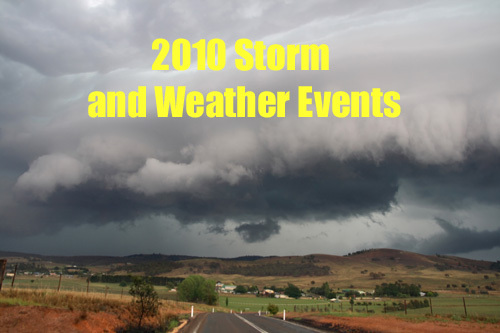 19th November 2001 - Non severe storms - Glen Innes to Coffs Harbour. 2nd October 2001 - Late evening / night chase in Illawarra. 26th August 2001 - Non severe, but small hail from squall line. 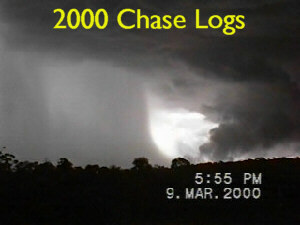 22nd April 2001 - Funnel cloud near Wagga. 28th February 2001 - Severe squall line. Illawarra and Sydney. 4th February 2001 - Severe storms, souther highlands, Picton and Appin. 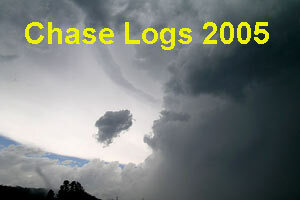 4th January 2001 - Non severe storm over Southern Highlands. 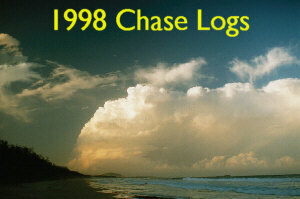 1st - 7th December - 1999 Storm Chase Tour. 22nd September - Brilliant mammatus in wake of severe storm. 14th April 1999 - Genesis of the Sydney Supercell Hailstorm. 13th March 1999 - Picton and Southern Highlands, NSW. 12th March 1999 - Southern Highlands, NSW. 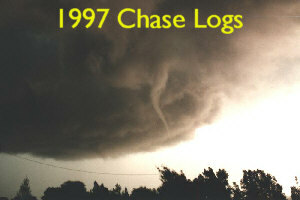 11th -14th December 1998 - Four storms ( and chases ) in four days. 30th November 1998 - Sunshine Coast, Queensland. 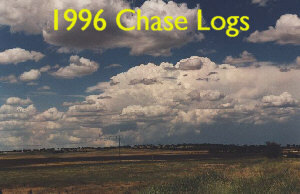 September - October 1998 - Storm Chase Tour of Northern Tablelands. 10th July 1998 - Snow chase. 16th November 1997- Clarence River $3 million storm. 26th October 1997 - The one day too early chase. 3rd October 1997 - Half Hearted and unsuccessful chase. 23rd March 1997 - No place like home chase. 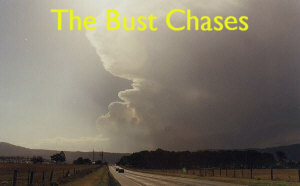 Storm chasing in Australia is not as predictable nor as productive as in the USA mid-west. Lack of moisture depth is a constant problem, however Australia is no stranger to supercell storms, but tornadoes are very rare. Chasing Australian storms is made more difficult as there is very little in way of technical resources and support to rely upon and you chase on what your eyes tell you. The road network is poor by mid-west standards and there are large areas of country that are simply inaccessible. My chase reports mostly feature storms that would keep most US chasers in bed, but I will chase anything, anywhere, anytime ! I am 55 years old and have been storm chasing and snow chasing since getting my car licence back in 1976. 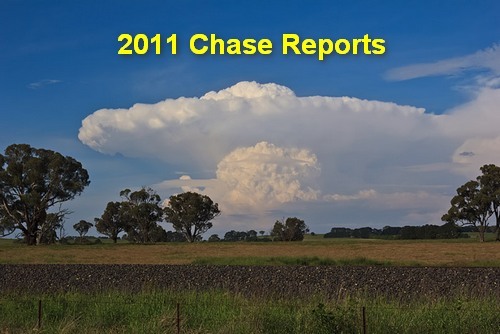 Back then supercells, wall clouds and inflow bands were unheard terms of in Australia. In fact I chased for hail, flash flooding and lightning shows rather than tornadoes, wall clouds or funnels.What is snow chasing? - when you live in an area where you can grow bananas in your garden and snow has never fallen since white settlement, even a drive up onto the southern tablelands hunting that elusive freak fall is a thrill. Australian Severe Weather - Excellent site with a wealth of information regarding severe weather in Australia, also features photos, storm news, a weather observation guide and lots more. 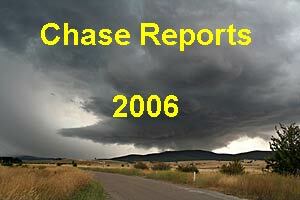 This site is very good for getting the technical information that mine lacks in regard to chase days. Brisbane Storm Site - Photos of Queensland storms, plus an extensive historical database on past severe Brisbane storms. Brisbane Storm Chasers - Great site featuring lots of photos from the Sunshine ( and storm ) state. Downunder Chasing - Some really great photos of Queensland monsters on this site. 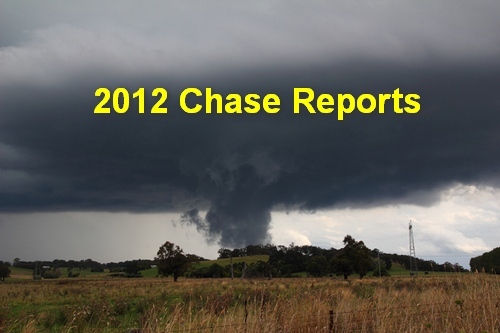 Inflow Images - Extensive information on Tornadoes in western Australia. Includes spectacular photos of the Northam Tornado. 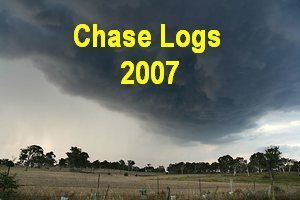 Melbourne Storm Chasers - An active site with lots of content and some great photos - not to mention perhaps the world's only train based chaser. 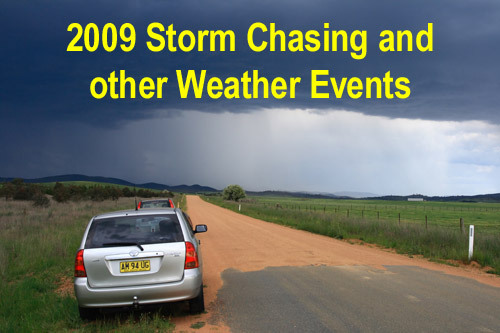 Sydney Storm Chasers - Matt Smith, James Harris and Daniel Weatherhead's ( what a name ! ) great site. Storm Planet.com - along with Melbourne storm chasers, David's site should convice even the most die hard of us that Victorian does get storms, and severe ones. Strike One -Lighning Photos - Michael Fewings excellent site, I wish I had these in my collection. Wild Weather World - Kevin Phyland has a collection of nice storm pics from one of the drier parts of Australia. Storm Track Homepage - An informative US site, presented in a excellent magazine style format. 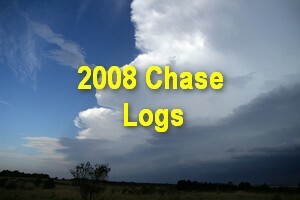 Links to chase logs and photos. Tornado Chase Day - A stunning collection of severe weather photos and educational features. Sam Barricklow's Storm Chase HomePage -Storm chasing, tornadoes, lightning, hail, thunderstorm and severe weather images and reports by SKYWARN Spotter, Storm Shooter, and Storm Seller, Sam Barricklow, K5KJ. Tornado Vortex Signiture - Chasing storms with David Drummond WX5TVS. Scott Blair's Arkansas Weather Watcher Homepage. - some great pictures and recent chases ! The Weather Club - site with an emhasis on severe weather, tornadoes and storm chasing.